Just a quick note to let you know that all 17 PG field staff arrived in Accra safely on Sunday and began a 5-day workshop at Faith Montessori School. The course timetable includes theory and demonstrations in the morning and practice in the afternoons. 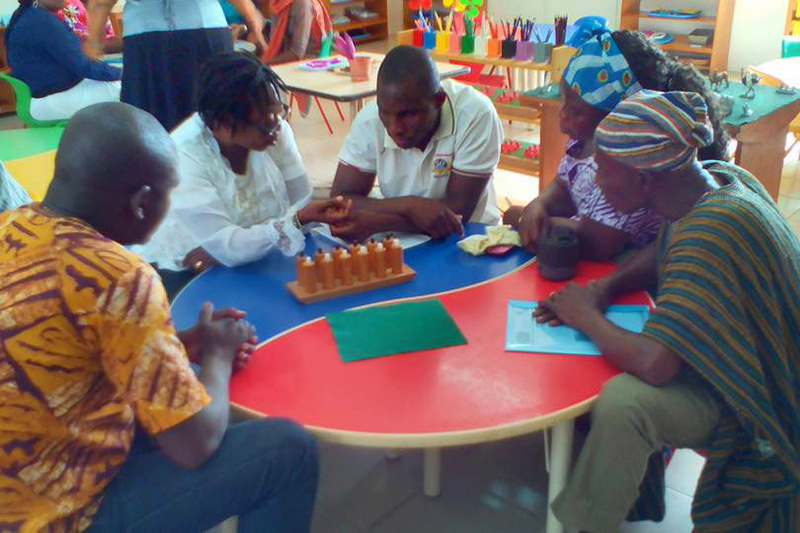 Yesterday, we began with an overview of Montessori philosophy and practical life activities. Today, the focus will be on numeracy/arithmetic, followed by literacy and language, and cultural studies to Thursday. Friday is reserved for Outdoor, Cosmic Education and Art & Creativity. Our first day went very well. There was a 2 hour practical practice in a Montessori classroom. Participants had so much fun and participated all throughout. One remarkable observation made was that all teachers of the Faith Montessori served well as guides in all the practical lessons we understood. Madam Emma, the director of Faith Montessori has really made efforts to make us as comfortable as possible. The accommodation is adequate and we have 3-square meals. There’s also a bus that takes us from the hostel to the course center.